The town’s cricket community lost one of its most dedicated supporters when Barry Rabjohn passed away peacefully in Leicester Royal Infirmary last week, aged 79. Barry was one of the founder members of Melton Town CC after his ATC side combined with the Old Grammarians, and he played in their debut match against Holwell Works CC in 1969. 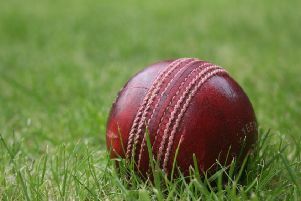 Their inaugural fixture ended in a narrow six-run victory, with the opener making 26 in a total of 152, and earning a mention in dispatches in the Melton Times (April 25). Good enough to pass the magic 1,000-run mark in his most prolific season, he opened the batting for more than two decades, and also kept wicket for Town. Barry was joined at the All England Ground by batsman Geoff Kerman who saw plenty of his team-mate from the other end of the wicket, as well off the pitch as the two became good friends. “He was a very solid batsman and difficult to get out,” said Geoff. As well as Saturday league cricket for Melton, Barry also turned out for crosstown rivals Egerton Park in midweek evening matches. Barry was keen to pass on his experience and love for the game to the next generation, and with Geoff, qualified to coach and run Melton’s junior sides. But his duties went further still. Smaller clubs rely on their players to muck in with a variety of roles, and as well as a spell as fixtures secretary, Barry also helped with the upkeep of the square, scoring, and also sent reports to the Melton Times. He reluctantly called time on his playing career in the mid-1990s while well into his fifties, but was far from finished with the game. Not wanting to stray too far from the cricket square during summer Saturdays, Barry stayed as close to the action as he could by qualifying as an umpire. And retirement from his day job at Melton College brought more time for his beloved sport as he spent many long afternoons at Grace Road watching Leicestershire with his late wife Pauline. But cricket was not the only passion for this sporting all-rounder. Having also played football in his younger days, Barry also competed for town teams in squash and table tennis, the latter alongside Geoff with the Nomads. He then took up bowls in later life and was a member at Melton Indoor Bowls Club for about 20 years where his name appears on the club’s honours board as a multiple winner in the Men’s Triples League. * Barry’s funeral takes place at St John’s Catholic Church, in Melton, on Tuesday at 2pm, followed by burial at Thorpe Road cemetery. Family flowers only, and donations to Alzheimer’s Research UK. All enquiries to Richard Barnes Funeral Directors on (01664) 565311.